Partly, Reed is sympathetic because Robert Moloney is such a skilled and charismatic actor. Especially as played by Moloney, Reed is so emotionally transparent, so charmingly funny, and so earnest that it’s hard not to feel for him as he struggles to understand Angie’s furious accusations, and as he trembles when confronting the notion that he may have unwittingly destroyed his life. I’m not saying that Reed’s actions weren’t wrong or harmful. I’m not saying that he’s not frustratingly oblivious. 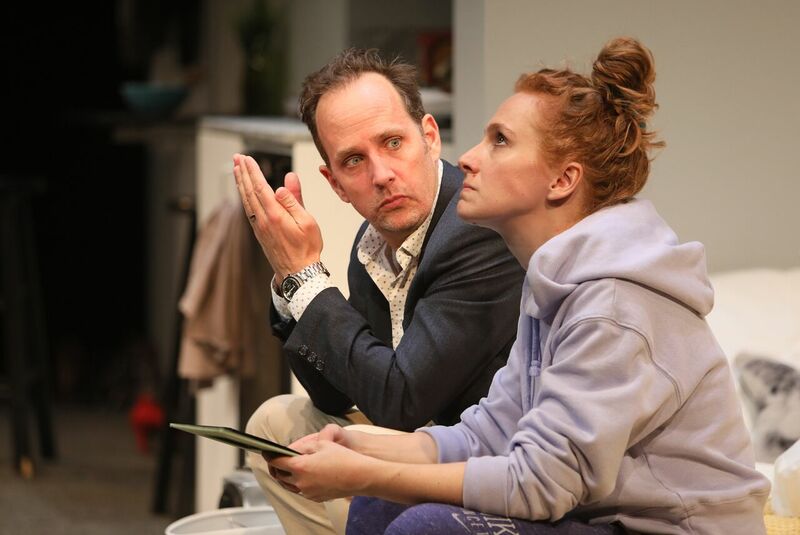 I’m just saying that the playwright and the actor allowed me to see the character’s vulnerability—and struggle is interesting. Amy Lee Lavoie’s script presents actor Kayla Deorksen with a bigger challenge. Off the top of the show, as Reed is stumbling around and trying to be affectionate, Angie is going after him hammer and tong. The character’s anger is a wall. That’s what anger is good for, of course: self-defense. But a relatively impervious barrier isn’t very engaging theatrically. And it takes a long time for Angie to get to the heart of her accusation, to name exactly why she feels so violated. I understand that, dramatically, a delayed revelation can be helpful. But, in this case, one of the unintended consequences is that, for a long time, Reed is a dynamic, comprehensible, and engaging character, while Angie stays locked in a relatively static position. Deorksen doesn’t show us a lot of Angie’s cracks until later in the evening. Again, don’t get me wrong: I’m not saying that women in general and Angie in particular don’t have a right to be angry. I’m just saying that the dynamics of this piece—as written, I think, and certainly as presented—unbalance the more even-handed dialectic that I think the playwright is going for. That said, C’mon, Angie!is absolutely worth seeing—and it’s never dull. Lavoie is an extremely promising young writer—in her thematic ambition, her facility with dialogue, and especially her way with comedy. Yes, comedy. For all of the seriousness of its subject matter, C’mon, Angie! is often very funny. Early on, when Reed is baffled by Angie’s sudden—to him—change in attitude, he says, “What’s next? Is Glenn Close going to kick down the door? Especially once we start to get to the heart of Angie’s accusations, the thematic richness increases, leaving one with all sorts of questions about honesty, responsibility, courage, pragmatism, and justice. C’MON, ANGIE! By Amy Lee Lavoie. Directed by Lauren Taylor. A Touchstone Theatre production in association with the Firehall Arts Centre. At the Firehall Arts Centre on Friday, June 1. Continues until June 9. NEVER MISS A REVIEW: To get the best of my theatre writing, including my reviews, once a week, sign up for FRESH SHEET, my free weekly e-newsletter.